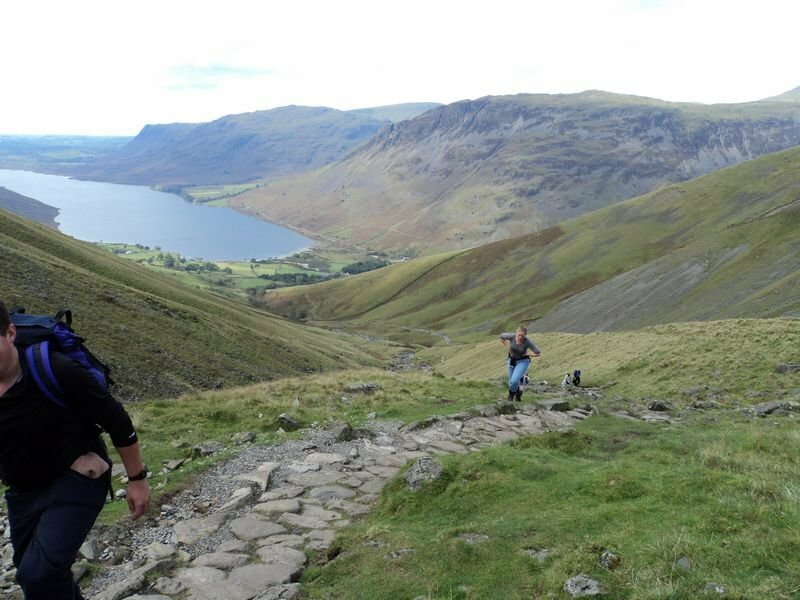 During busy season, the unceasing stream of people never seems to stop, not even during the night on the Brown Tongue path, the path used by approximately 100,000 people each year, the shortest way to Scafell Pike top, England’s highest mountain. It continues to be a heavily frequented path of its kind in the world. But this unwelcome popularity has extracted and continues to extract a very high environmental price. The intrusion of too many unwelcome feet continues to be a problem. It is not an environmental issue that is being ignored. In this case, work to control routine erosion due to the continuous impact of innumerable feet on the narrow trail, has been undertaken for over 30 years. These repairs come at a cost of over ten thousand pounds every year. It is turning out to be a difficult path to carry out repairs: veritable work that is never going to be finished for ages. As the crowdfunding drive to raise critical funds for the various work phases for the pathway, entered the final phase (which closed on 21st October 2018), funds were still a long way from the £17,000 target. Pathway repair specialists stress the significance of triumph for a campaign that enables them to future-proof a major portion mid Brown Tongue, for many decades to come. 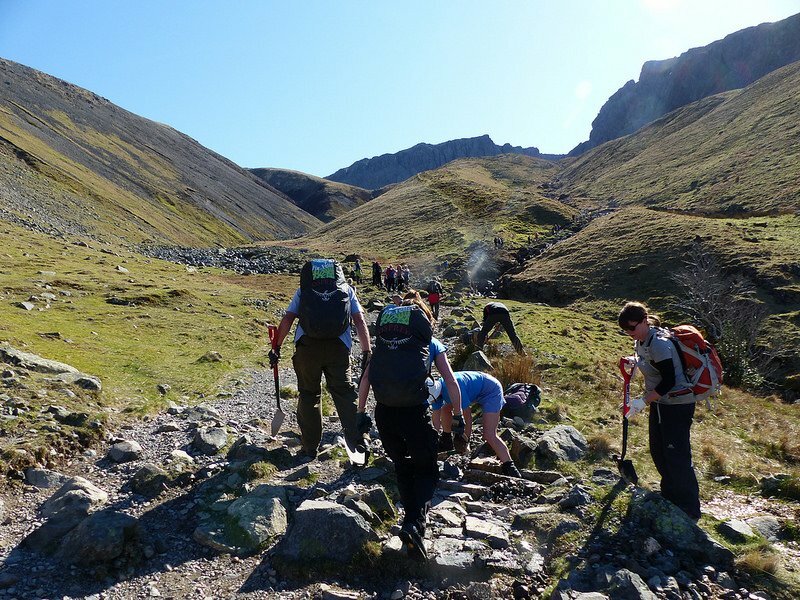 This sustained crowdfunding effort is part of a greater, sustained year-long funding campaign to raise about £100,000 under the Mend Our Mountains campaign for Scafell Pike, a country-wide appeal for funds steered by the British Mountaineering Council. This campaign is one of similar campaigns (13 in all) which are simultaneously being run under Mend Our Mountains and other such organisations in Britain. The current funding target seeks to raise £1 million for repairs of paths in various locations, ranging from Sussex to Scotland. 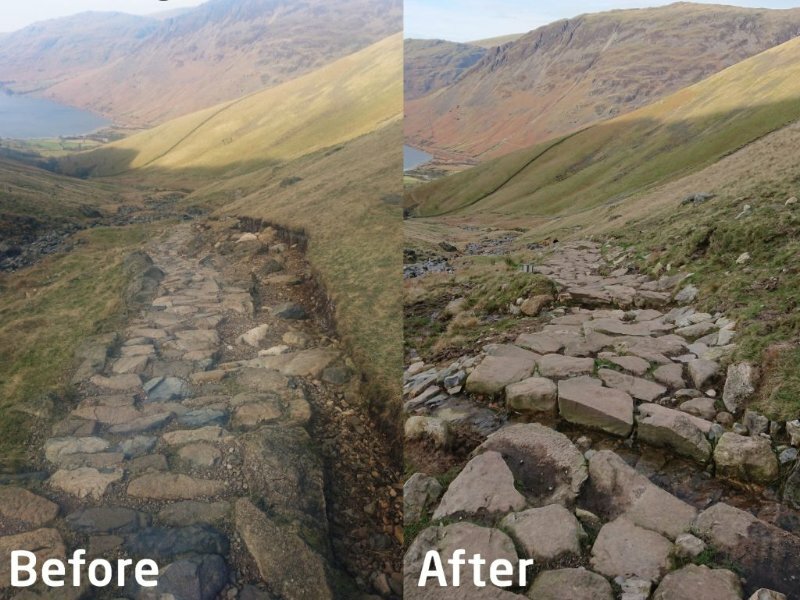 The British Mountaineering Council manages this campaign called Mend Our Mountains, which also supports the Fix the Fells’ continuing work to stabilise soil loss and erosion along the route as well as trying to raise £17,000 that is required for routine maintenance. 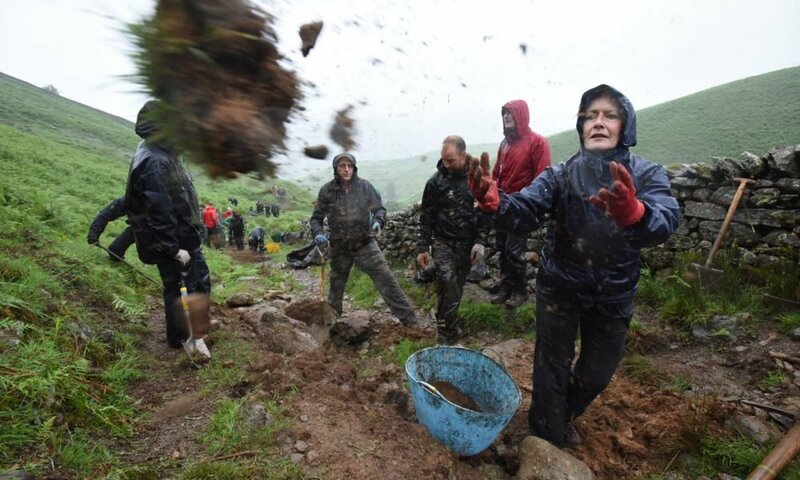 Experts from Fix the Fells, lead the groups of specialist path menders who do the tough and arduous work, come rain or shine, and protect Brown Tongue and other mountains in Lake District from the unintended ecological damage triggered by thousands of human feet. They say that there is no other place on this planet which witnesses this kind of pressure from humans, as seen in the Lake District. There is a sense of gratitude for the folks working under Mend Our Mountains for their backbreaking work and enthusiasm. It’s important for such campaigns to succeed. There will be no government funds available for Brown Tongue and so there has to be reliance on fundraising efforts to keep repair works going on. Brown Tongue happens to be the route favored by most participants of the popular Three Peaks Challenge, which has them scale the highest elevations of England, Wales and Scotland in a span of 24 hours, which unfortunately adds to burden on the path. Most contenders prefer to attack Scafell Pike during the night, trudging up the Brown Tongue under the light of the head-torches. Brown Tongue symptomizes one of the gravest examples of problems found across popular mountains and hills in Britain. If left alone, these erosion mutilations can propagate to become as broad as a motorway, erasing out all signs of vegetation, disturbing hydrology and local habitats, and even destroys terrain features like mountain tarns and downs. Should the overnight working be stopped now, within the next 5 to 10 years, massive disfigurements of the sort that destroyed the Lake District some 30 years back, will once again appear here. Fix the Fells has been using a combination of traditional techniques such as stone pitching and landscaping but it was turning out to be a rather costly affair. Usable local stones had to be air lifted and flown out from the nearby slopes as the path repairers need to be skilled craftspeople who are able to carry out well-designed, high-quality works that should be able to blend in with the surrounding landscape and besides, must last for a very long time. 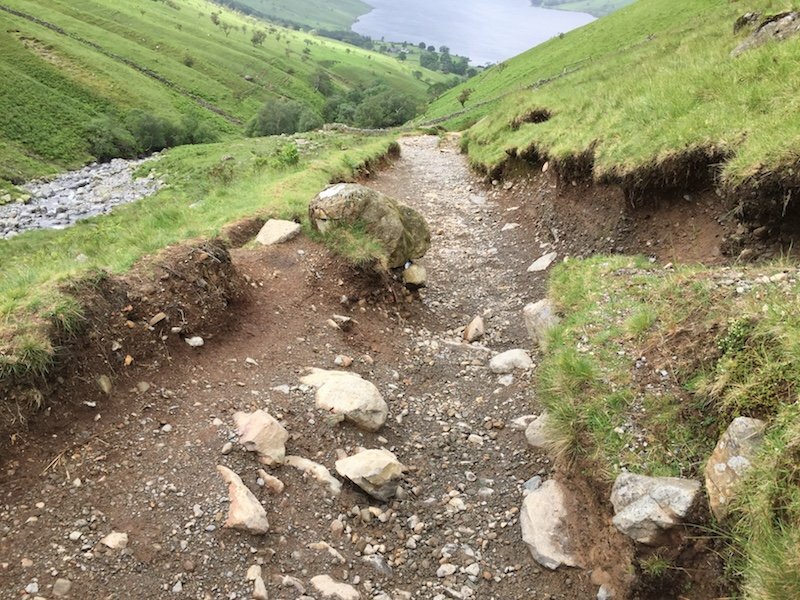 To maintain all the Lake District mountain paths and finance the work under Fix the Fells, it costs about £500,000 per annum. As done by similar organisations worldover, organisations rely on sustained fundraising to carry out the repair work. Thus, crowdfunding options have to continue so that these mountain paths can be repaired for future generations of trekkers to enjoy.